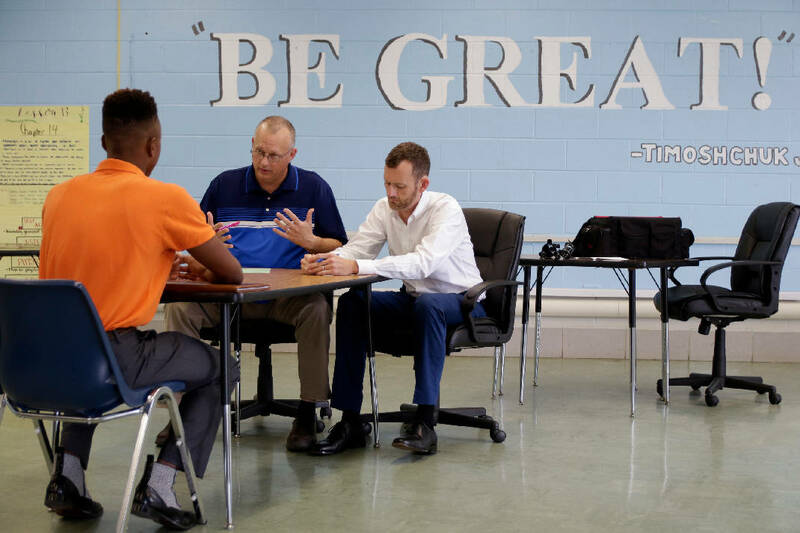 Marlon Kennemore, left, talks with Stacey Allison, center, and Jeremy McDougal from TVA during mock interviews at Hixson High School on Thursday, June 14, 2018, in Chattanooga, Tenn. The interviews were conducted as part of Project Search, a partnership with the Hamilton County Department of Education and area businesses like BlueCross BlueShield that prepares students with learning and intellectual disabilities for transition to adulthood. Martin Boatwright thinks his personality would make him a great car salesman. Brittany Barnett gave it some thought and hopes to be a doctor, and Josh Wooten's dream job is working on Best Buy's Geek Squad. These students, recent graduates of Hamilton County Schools special education programs, got one step closer to their dream jobs this week. Through Project Search, a new partnership between BlueCross BlueShield of Tennessee, Siskin Hospital for Physical Rehabilitation and the state's Vocational Rehabilitation services, eight students will get on-the-job training as interns at BCBS this fall. This week, the students met at Hixson High School for Camp Work Readiness to learn job and life skills, such as when to go to your boss with a problem and how to prepare a meal, and preparing for the culminating activity — mock interviews. "So many people look at them and think they can't do anything, and they can," said Wendy Evett, the new Project Search coordinator at BCBS and a former Hamilton County exceptional education teacher. Community and business leaders paired up Thursday for interview rotations. The leaders, representing TVA, BCBS, Hamilton County Schools and more, asked the interns about their strengths and weaknesses, previous work experience, and how they would approach a workplace problem. "I'm very excited. This gives me a very good chance to learn about what it is like in the real-world workforce," said Marlon Kennemore, 18. During Kennemore's first mock interview, Jeremy McDougal and Stacey Allison from TVA asked him about himself and his interests. "I'm 18 years old. I like to move around, work out. I'm a team player and like to help people solve problems," Kennemore said. He also asked for real-life advice, like what to do when a colleague doesn't fairly share the workload. "That's part of life, unfortunately," Allison said. "No matter what type of job you have, I would concentrate on yourself and do the very best you can do." Project Search was developed at Cincinnati Children's Hospital Medical Center in the 1990s with the goal to prepare young people with disabilities for employment and help in the transition from school to adulthood. Individuals with disabilities often have access to a lot of services while in school (where they can stay up to age 21 in Tennessee), but that access may disappear when they leave school. "Unfortunately, they often go home," said Jennifer Allison, exceptional education lead teacher. That means young people with disabilities may not know about available services or be able to find jobs that would help them become independent. Red Bank High School Principal Elaine Harper agrees schools have a ways to go in aiding students' transitions and setting them on the path to success. "We do a good job of providing services for them while they're in school," Harper said. "We need to prepare them for this next phase of their lives, so when they leave our schools they are prepared to enter their lives with the skills they need." The eight interns are 18 to 21 years old and have a variety of intellectual disabilities. Some of them went to Soddy-Daisy High School together with their former teacher Evett, who is joining them at BCBS as the new Project Search coordinator. "I'm very happy to be with BlueCross BlueShield, this is a blessing for me," Kennemore said. The interns will be at BCBS from 8 a.m. until 3 p.m. daily and follow the regular school calendar. They will start and end their workdays with Evett, reflecting on the day's events and tasks. The rest of the time they will work within the mailroom, facilities and maintenance, and other departments based on their skills. "This is a wonderful experience to get to help these interns prepare for their experience at BCBS and future jobs," said Brittani Brown, a risk management consultant for the company. Evett hopes other local businesses will see the program's value and will also want to partner as a Project Search host site. The application for the next intern rotation will start in the spring. The program is open to recent graduates of Hamilton County schools who are aged 18 to 21.